The Sportline Evolution is the newest addition to our Sportline series of seats. The Evolution was designed to give you just enough lateral support to hold you in place, while at the same time making it easy to move around or get in and out of your vehicle. This feature makes it ideal for the street, the track, or offroad. The Evolution features top of the line injection molded foam, strategically placed bolsters to support you in just the right places, and harness belt capability. The Sportline Evolution is available in black vinyl with a carbon fiber vinyl contrast. It also features silver offset harness slots and red offset stitching to give it an added touch of luxury. The Evolution has a seat base height of only 2.5 inches. What that means is if you sit the seat on the floor the distance between the floor and where you would sit is 2.5 inches. 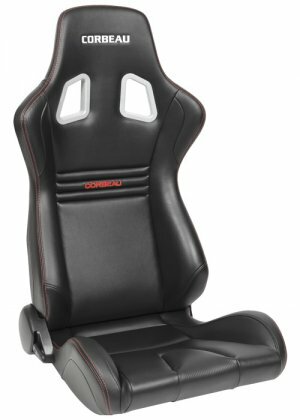 Comparatively speaking this is a thin seat base, which is ideal for minimal headroom applications or for drivers wearing helmets. Please note that because of the design of the Evolution, a 5th slot cannot be added to this seat. As a rule of thumb the Evolution will fit up to a 38-inch waist. Listing is for one (1) seat.